it feels better already, doesn't it? yay for us! the 20th was also my two year anniversary with a very special young lady, so that made the day even that much sweeter. the down side is that i've had a crazy cold for about a week now, and while i feel somewhat better, i am super congested. i'll get over it. one of the projects that i took on a few weeks ago was to build a book for the "art of coraline" show at the cartoon art museum in san francisco. i kept process journals for all of my armature designs and doodles throughout the production, and someone thought it might be a good idea to put some of that work in the show. of course, instead of just scanning some pages and saying "here you go", i volunteered to make a replica of the whole dang book. 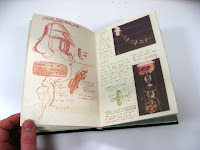 the problem was, there were 2+ moleskine journals worth of crap to go through, so i wound up including only(?) 48 pages in the recreation. i'm not sure if they are having a fancy opening or closing reception, or if henry is going to make an appearance or anything, but regardless of fanfare the show is definitely worth a look. i've seen the selection of art and puppets that are going to be on display, and i think it will be a worthwhile trip for anyone who is interested in that sort of thing. there was so much beautiful artwork done for this film. really great work. seriously. and as an added bonus, if you visit the gallery before the 8th of february you can still see the current totoro forest project show, which is amazing. a few coraline artists have work in that exhibit as well. any of you fine folks who manage to check the show out should let me know if my book has been tagged or vandalized as of the date you see it! except for the stress of trying to get the thing finished on time it was a lot of fun to make the book. 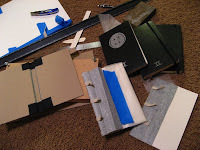 it has been a long time since i have done any book binding, and this little project reminded me how rewarding it can be to make your own journals. perhaps i shall make more. It's beautiful Jeremy! I always thought your Coraline journals were gallery worthy. That must have been so satisfying to make a complete book from start to finish, using all your material. I'm so glad there's a show to put it in! That's brilliant and beautiful, man. I'd love to check out your journals. Once I'm done with this book, and once you guys are free from germs, let's pencil in a time to connect! We are long overdue. Heya, I talked to the guy at the thing, he said Henry will be there Monday and Tuesday, doing interviews for all the local newspapers. The book looked really great!! I just saw your journal at the Cartoon Art Museum today. It was totally the highlight of the exhibit for me. The amount of experimentation you must have done is just staggering. I didn't realize you bound the book yourself too! I posted about it here. Hope lots of other people here in SF go to see it (and the movie too) over the next couple of weeks! 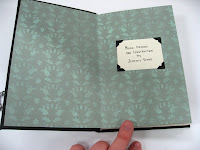 BTW, the condition of the book as of 2/1/09 was completely pristine. Nary a smudge. Awesome work, Jeremy! 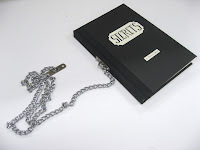 Will Secrets be sold in book stores or is this a limited edition thing? its a limited edition of... 2. i made an extra because i thought i'd probably screw up the first one and have to start over. luckily i didn't screw up the first one, at least not bad enough to ditch it completely. the bad news is the 2nd one has a mistake that bugs me to no end, although i'm not even sure if anyone else would notice... its not quite finished though. not sure what i am going to do with that one. could you please post more pictures on the topic of miss forcible from coraline? I concur with what anonymous said. I would pay for the download version of this book. Even better would be a complete book compiled on all your notes about armatures. There is a market out there for it. I would find it a very valuable resource.